Welcome to Raja Road Rail, we are based in Lower Mainland British Columbia and expertise with new technology of Container Move Transport in Vancouver, moving Regular freight and Oversized freight from any Terminal and Ports of Vancouver, B.C. 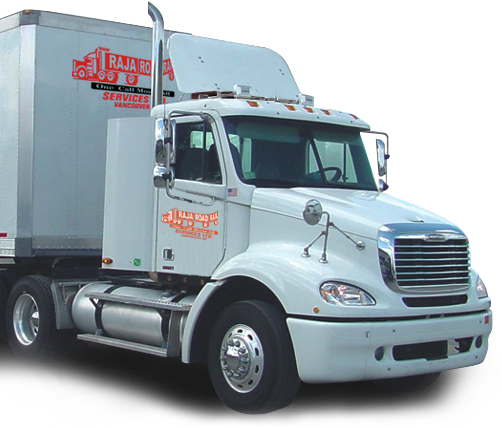 move hauling different types and Load size of containers, including 40' container, 20' container drayage, combo chassis 12 point chassis, b-train load (range from 20’ to 53’) using our premium trucks and trailers. Raja Road Rail is expert in container trans-loading, dry van load. We always strive to be the most efficient, prompt, cost effective and environmentally friendly manner to move your freight. RAJA ROAD RAIL SERVICES is a leading freight carrier and we are determined to be the number one choice. and secure sales. Whether your are a local Supplier to the retail sector or a custom broker moving containers, with a wide range of time sensitive freight transportation and Container services, Raja Road Rail will get you there. Our focus is to provide constant and consistent availability for service-sensitive customers in virtually every transportation environment. We attribute our superior service to an unconditional commitment to our core set of values. Our experienced and professional leadership team and staff have the knowledge and capabilities to provide the highest level of Transportation and Container services to our customers as well as an exceptional work environment for our drivers. The principal commodities that we transport include retail store merchandise, manufactured goods, paper products, non-perishable and perishable food products, beverages and beverage containers and building material. RAJA ROAD RAIL has superior equipments especially our train that allows us to haul two containers (20’) per trip. Using trains to haul containers is far more efficient, cost effective and significantly reduces the amount of greenhouse emissions.